Click to ‘Open carrier files (F2)’ or drag and drop audio file (flac, wav, wma, mp3, ape) to Carrier audio files list. Click to ‘Add secret files (F3)’ or drag and drop secret files into the Secret files list on the bottom side of application. Press F4 key or click to ‘Encode secret files’ button. You can choose output audio format (wav, flac or ape). DeepSound does not support wma output format. If you want to hide data into wma, hide secret data into wav file and then use external software such as Windows Media Encoder for convert wav to wma lossless audio format. In ‘Encode secret files’ dialog window you can turn on/off AES-256 encryption. Modified audio file will be copied to output directory. If you want to change output directory, click to Settings. 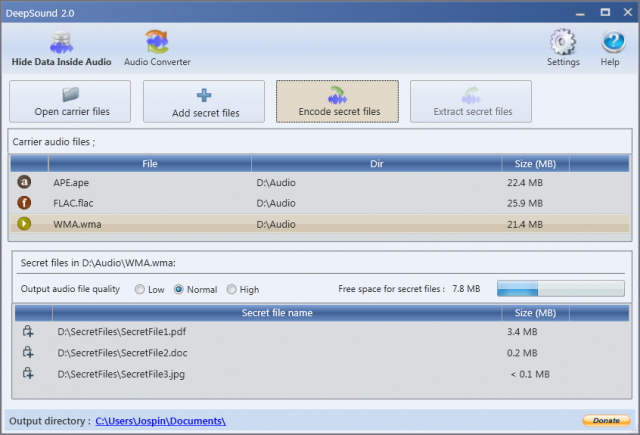 Click to ‘Encode secret files’ button to start hiding secret files into carrier audio file.